Emerald Book Co, 9781937110758, 288pp. Jason was hoping his Aunt Clara would come to his rescue, but she unexpectedly dies, gifting her liquid assets to charity. She does, however, will Jason a picturesque French vineyard--and it's worth millions. But there's a catch If Jason goes to jail, the vineyard will transfer to his unscrupulous stepbrother. Infused with J.T. 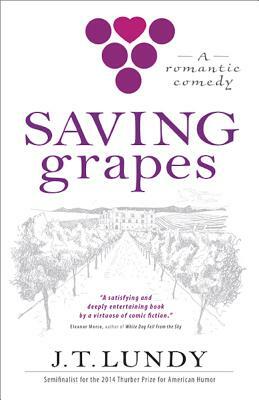 Lundy's deliciously skewed sense of humor, and full of flawed but irresistible characters, Saving Grapes is a rollicking, good-hearted Wodehousian comedy that speaks to the hapless romantic in all of us. J. T. Lundy lives in Naperville, Illinois, where he writes novels and screenplays. A graduate of Indiana University, he also holds an MFA from Spalding University and an MBA from the University of Chicago. He is the previous author of Happy Utopia Day, Joe McCarthy. Commenting on that book, Kirkus Reviews said that Lundy "is a talented writer who crafts vivid characters . . . and serves up vigorous prose with punchy dialogue."